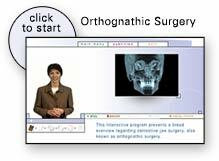 Orthognathic surgery (Jaw Surgery) is needed when the jaws don’t meet correctly and/or the teeth don’t seem to fit within the jaws. Teeth are straightened with orthodontics, and corrective jaw surgery repositions misaligned jaws. This process not only improves facial appearance, but also ensures that teeth meet correctly and function properly. People who can benefit from orthognathic surgery include those with an improper bite or jaws that are positioned incorrectly. Jaw growth is a gradual process and, in some instances, the upper and lower jaws may grow at different rates. The result can be a host of problems that can affect chewing function, speech, long-term oral health, and appearance. Injury to the jaw and birth defects can also affect jaw alignment. While orthodontics alone can correct bite problems if only the teeth are involved, orthognathic surgery may be required if the jaws also need repositioning. Any of these can exist at birth or may be acquired after birth as a result of hereditary, environmental or traumatic influences. Before any treatment begins, a consultation will be held to perform a complete examination with x-rays. During the pre-treatment consultation process, feel free to ask any questions that you have regarding your treatment. When you are fully informed about the aspects of your care, you and your dental team will make the decision to proceed with treatment together. If you are a candidate for this corrective jaw surgery, our oral and maxillofacial surgeons will work closely with your dentist and orthodontist during your treatment. The actual surgery can move your teeth and jaws into a new position that results in a more attractive, functional and healthy dental-facial relationship. Call Chicago IL - Associates for Oral, Maxillofacial, and Implant Surgery Phone Number 773-736-3300 to schedule your consultation for corrective jaw surgery. 5 out of 5 stars based on 8 Jaw Surgery reviews. I'm very grateful for the help I received. My regular dentist botched a tooth extraction. I was sent to your office for help. They got me in right away. Doctor was very good at explaining what she would need to do. She only took about 5 minutes to remove the rest of the tooth. She was very gentle when she was working. Very positive experience. Would highly recommend to family. friends, and coworkers. The staff and the doctor set a calm environment with their friendliness and professionalism. I was in the best of hands for the procedure which was painless. for having a tooth out it was as pain free as it could be. Very happy with my tooth extraction.. Staff very friendly and Dr explained everything as it was going to happen.. And NO PAIN!!!! Awesome job Mark!!! Keep coming back even though they are out-of-network on my insurance. It's worth it because the whole staff is wonderful. Dr. Russell Spinazza is AMAZING!! I truly recommend this for anyone who needs implants, extractions, jaw surgery, etc. I actually left feeling very respected and appreciated, which does not happen very often these days. Thank you.